On May 18th and 19th, be ready to party! That’s when the very first edition of Canada’s largest urban music festival will take place! 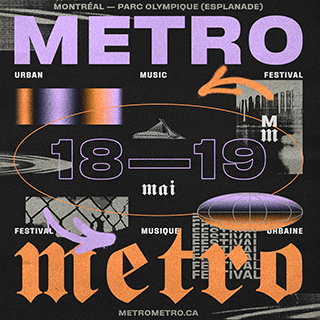 Featuring Hip-Hop, Rap, R&B, and Latin music, you’ll be able to attend performances by the world’s greatest artists, including two Montreal premieres. All this will take place through two stages, in an extraordinary setting, at the Esplanade of the Olympic Park in the heart of Montréal! P1 underground parking located at 4545 Pierre-De-Coubertin ave. or P2 located at 4141 Pierre-De-Coubertin ave.
Bike access via bike paths located on Rachel street, Maisonneuve Park and Bennett street. Bike racks are available just steps from the Centre’s entrance. There’s also a Bixi station on Pierre-de- Coubertin avenue, near Pie-IX Metro station. The Esplanade is accessible to people with reduced mobility, and adapted sanitary facilities are available at the administration office entrance at 4141 Pierre-De-Coubertin ave. for anyone who uses a wheelchair.